Simba and I were sent a blue SnapLeash for free in exchange for our honest opinion. We can also give one away to one of YOU! Keep reading to find out all about the SnapLeash and what we think of it. Don’t forget to enter the giveaway! Happy holidays! A Snap Leash is a dog leash that can be used in a variety of ways. The dog leash is made of tough pure high grade heavy thickness nylon with double ended nickel-plated swivel snap clips. According to SnapLeash.com the leash includes strategically spaced steel grommets to secure your pet around multiple sized objects including trees, handrails, doors, benches, etc. without having to tie a knot or unclip the leash from the collar first. How cool is that? You can also use the first grommet on the leash for a handle. Another way to use the grommets is to hang your keys or waste bags to them. How convenient! The dog leash measures 72-inches in length by 1-inch wide and also includes a lifetime quality guarantee. The colors that are currently available are red, black, and blue. View the Snap Leash video below for more info and how to use a SnapLeash! What Do We Think of SnapLeash? We think the SnapLeash is pretty cool and convenient. You can use the SnapLeash in a variety of ways and I really like that about it. It seems to be pretty durable and Simba doesn’t mind the leash at all. It’s very easy to use and I had no trouble hooking Simba to something or even putting the leash around myself. While the leash was around my waist, I was able to walk Simba and use my hands for other things. Simba doesn’t pull on the leash or anything like that and as you can see he is quite small so this was very doable with him. I’m not sure how that would work with a bigger dog though. All in all we think SnapLeash is a great leash and you should definitely try it out! Check out all the ways a SnapLeash can be used! Where Can You Buy a SnapLeash? 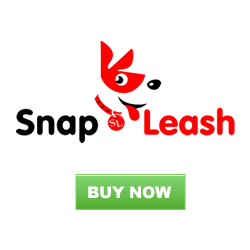 You can purchase a SnapLeash online by visiting the SnapLeash website by clicking HERE or clicking the banner below. The SnapLeash is currently on sale and can be purchased for $12.99 or $14.99. Would you like your own SnapLeash? Well, here’s your chance. One person will be randomly selected through Rafflecopter to win one SnapLeash of his/her choice. Simply enter by using the Rafflecopter widget below. The more entries you have the better your chance at winning the prize of course, but you only need one entry to be entered. Make sure you read the terms and conditions via the Rafflecopter widget to read the full requirements to enter and also read the Disclaimer. You must be in the US and 18 years or older to enter. You have until 1/07/2015 12AM EST to enter. Good luck! Disclaimer: I was given a SnapLeash in exchange for a fair and honest review. I was not compensated for this post however, I may receive commission if you purchase a SnapLeash by using affiliate links that are posted on this blog. We always share things that we find beneficial to our readers and things that Simba and I love. All thoughts and opinions are my own. SnapLeash sponsored this giveaway and is responsible for shipping the prize to the winner. I like that it is so many things in one product. I would use this when we take the dogs camping in the summer. Wow, that seems pretty nifty! I would use this as a two dog leash, since I have six dogs! Thanks! I love the variety of ways you can use the SnapLeash ….very cool product! I would use it as a 2 dog leash, tether and hands free leash.